(W) Karl Kesel (A) Various (CA) Skottie Young. 'Flame on!' as the Fantastic Four's resident matchstick scorches into his own solo series! Johnny Storm faces his greatest shame when he is called upon to investigate a case of spontaneous human combustion. But to solve the mystery plaguing New York's Bravest, he will have to fight fire with fire! Then, feel the burn as the Human Torch finds himself prisoner of the Locust King. Will romance be rekindled with Johnny's old flame Namorita? And what Strange Tale could lead to a good, old-fashioned Two-In-One with his best pal, the Thing? Enter: the Dragon Man! As Fantastic Four stalwart Karl Kesel serves up the sizzling dialogue, discover the book that ignited red-hot artist Skottie Young's career - and blazed a trail for his wonderful OZ adaptations, fan-favorite variant covers, and upcoming ROCKET RACCOON series! 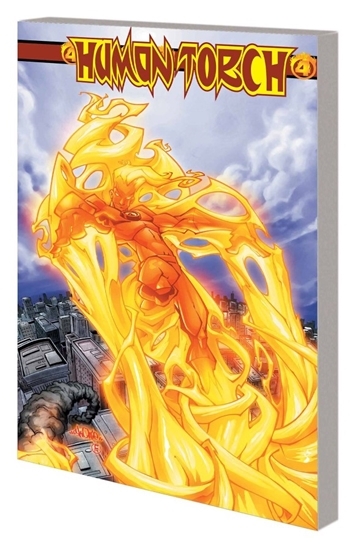 Collecting HUMAN TORCH (2003) #1-12.